President Obama will reconvene with lawmakers Monday afternoon to hammer out a deal to raise the debt ceiling - a routine he says will continue daily until a deal is reached. Though the so-called "grand bargain" he proposed last week appears all but dead, Mr. Obama again plans to "make a case for doing something big" at a press conference Monday morning, a senior administration official tells CBS News political analyst John Dickerson. The official said Mr. Obama told congressional leaders on Sunday that "if they didn't think they could go big, they should come back today with alternatives that could pass both" the Republican controlled House of Representatives and the Senate, controlled by Democrats. Ahead of the Sunday night meeting between the president and bipartisan congressional leaders, which dissolved without resolution to the months-long stalemate, Mr Obama said "we need to" work out a compromise within the next ten days - and that he plans to continue his push for a comprehensive deal that will take the U.S. government through 2013. Boehner, after earlier proposing doing something big himself, acknowledged on Saturday that a plan to save the government $4 trillion would not garner the support of Obama: We have 10 days to make a debt dealhis conservative colleagues, who are firmly opposed to bringing more revenue to government coffers. During an appearance on CBS' "Face the Nation" on Sunday, Treasury Secretary Timothy Geithner said Mr. Obama "wants to do the largest possible deal that's going to do the most for the economy." A Republican briefed on Sunday's meeting told CBS News that while GOP leaders also hope for a comprehensive deal, they don't see a feasible path for reaching such a compromise. The Republican indicated that tax increases remain a primary matter of contention in the talks, and that Boehner has shut down the suggestions that he move off his dollar-to-dollar debt limit increase-to-spending cut framework. Boehner said Saturday that a more modest deal of $2 trillion - half of the original $4 trillion goal - was more reasonable, particularly in light of the suggestion, by Republicans, that the Vice President Joe Biden's bipartisan team had identified (although not agreed on) approximately $2 - $2.5 trillion in cuts. Democratic Rep. Chris Van Hollen, who has been representing House Democrats in the talks with Biden, calls that figure "grossly inflated." "It was never there. That's the problem," Van Hollen said of the $2 trillion in cuts, on a Monday appearance on CBS' "The Early Show." "What we talked about was about $1.1 trillion in cuts and savings. You're hearing grossly inflated numbers coming out from the Republican side. In the Biden group we did not get close to $2 trillion in cuts and again the gap there was closing these corporate tax loopholes." "We did make some progress but at the end of the day as you know the republicans walked out of the talks," Van Hollen said. "Democrats agreed to some cuts, but at some point we said you need to have balance here. You cannot be whacking all these programs - and of course the Republican budget calls for the end of the Medicare guarantee, called for deep cuts in Medicaid and education. We've said we're not going to be doing those things when you've got people with these big tax loopholes, oil and gas companies. That's why the president is saying in some ways, doing the medium sized deal is just as hard as doing the big deal so why don't we just do a big deal and get something done for the country." Boehner, however, appears firmly resistant to the idea of tax increases. An aide for Boehner told CBS News Sunday that the Speaker reiterated during the meeting "the fundamental principles that must be met for any increase in the debt limit: spending cuts and reforms that are greater than the amount of the increase, restraints on future spending, and no tax hikes. The President agreed with the Speaker that their previous talks did not produce any agreement. The group agreed to continue talks in the coming week." According to the aide, Boehner thought the Biden team was most likely to produce a "viable" deal. "The Speaker told the group that he believes a package based on the work of the Biden group is the most viable option at this time for moving forward," the aide said. In a Sunday night statement, a spokesman for Senate Minority Leader Mitch McConnell called Obama's performance in the negotiations "disappointing." "The members will meet again tomorrow, though it's disappointing that the president is unable to bring his own party around to the entitlement reform that he put on the table," Don Stewart, a McConnell spokesperson, said Sunday night. "It's baffling that the president and his party continue to insist on massive tax hikes in the middle of a jobs crisis while refusing to take significant action on spending reductions at a time of record deficits," he added. House Democratic Leader Nancy Pelosi has continually insisted that any deal must not include reductions that would hurt the beneficiaries of Social Security and Medicare programs. "This package must do no harm to the middle class or to economic growth. It must also protect Medicare and Social Security beneficiaries, and we continue to have serious concerns about shifting billions in Medicaid costs to the states," she said in a Sunday night statement. The former Speaker emphasized, however, that Democrats remain "hopeful for a large bipartisan agreement, which means more stability for our economy, more growth and jobs, and more deficit reduction over a longer period of time." A spokesman for Senate Majority Leader Harry Reid reiterated his commitment to a deal that included tax increases, and accused Republicans of taking "the easy way out." 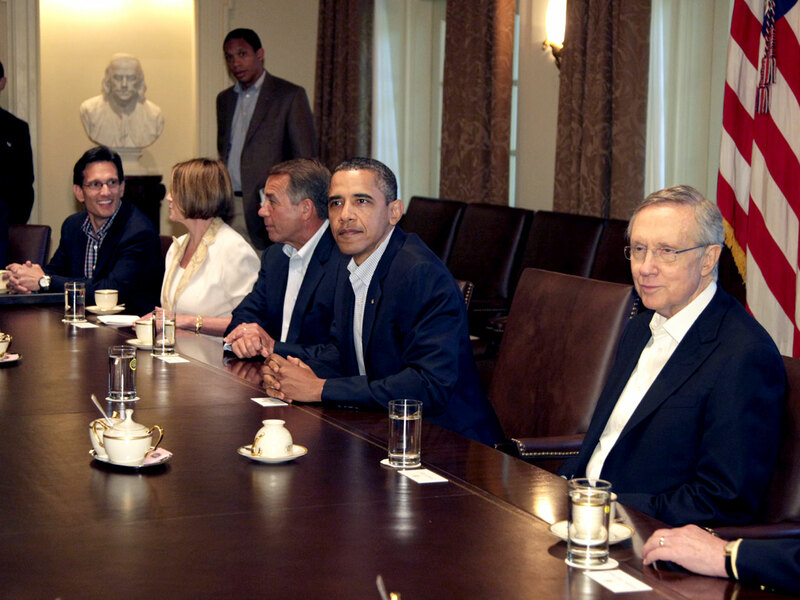 "Senator Reid remains firmly committed to getting the most robust deal possible," said Reid spokesman Adam Jentleson. "He stressed the need for an approach that is balanced between spending and revenues, in terms of timing, specificity and dollars." "Senator Reid believes the stakes are too high for Republicans to keep taking the easy way out," he continues. "He is committed to meeting every day until we forge a deal, however long that takes." Lucy Madison is a political reporter for CBSNews.com.